Braces are an amazing invention! Amazing in that they actively work over time to correct and straighten your teeth. No one can deny that there is a difference in the appearance between someone who has had braces and who has not. When you have crooked or broken teeth, your outward appearance immediately looks disheveled and unkempt. When you have sparking, straight teeth, however, you look better! Though there are so many benefits to braces, they can cause issues when it comes to eating some of your favorite snacks. An orthodontist will often supply their patients with small brushes to clean out their braces. However, it might help you save time if you just stay clear of certain foods. The following is a blog listing off the different snacks that are notorious for getting stuck in your braces. Though you don’t have to stay clear of these foods altogether, if you at least are aware of which snacks can get stuck, you will be more prepared when you have to clean out your braces after eating. Though this is technically not considered a food or snack, and you should never swallow it, gum makes it on our list. Why? Well, gum is chewy and almost always finds a way to wind itself into your braces. Today, gum is made with synthetic rubber and a mix of artificial and natural materials, which give gum the chewy and stretchy texture. Though gum is a great method for loosening up your nerves and giving you fresh breath, it is not beneficial to you or your braces. Part of the reason why gum is ill advised when you have braces is that it can get stuck in your braces, it is difficult to clean out, and depending on how you chew, it could damage your braces. The issue with gum is that when you chew it, you risk that the gum will bend the wires of the braces, which obviously compromises their alignment and causes them to slacken. You don’t have to completely cut gum out of your life; however it is good to know the risks a chewing habit could have on your orthodontia. Whenever you go to the movies, always keep in mind that popcorn is just about one of the worst things to eat when you have braces. The kernels of the popcorn can easily wedge themselves in between your teeth, which make it impossible to clean them out from your braces. So before you order a jumbo popcorn, think about how many minutes you will have to stand by a mirror to clear out the kernels. Cheez-Its are a wonderful snack for many reasons; the first being that they are cheesy. The second, they are salty. These delectable cheesy, salty snacks are perfect in a packed lunch or for a picnic. Though delicious, they are problematic when you have braces on. When you chew a Cheez-It, your saliva and the cracker combine together to make a sticky mess that is terribly difficult to clean. Caramels are deliciously tasty. Nothing is better than sinking your teeth into a soft caramel candy. However, because of how sticky they are, they attach to your teeth in a cement-like fashion. Because of this, it is difficult to maneuver your brush in between your braces to get every last bit out of your mouth. If you do not clean your braces properly, consequences can arise. For instance, if you keep your braces uncleaned, it can compromise the effectiveness of your braces, cause cavities, and looks absolutely awful. It is easier on your braces for you to eat sweets that are less chewy, such as chocolate bars or hard candies, like candy canes or Jolly Ranchers. Chips are the perfect companion to any sandwich; however, they are also extremely difficult to clean out of your braces. Because you often chew chips into many different pieces, the tiny particles of chip tucks in between your braces and your teeth. Chips are also difficult to get out of your teeth because they leave behind a chip residue. So most often, you won’t just be brushing out your braces; you may even have to pack a toothbrush! 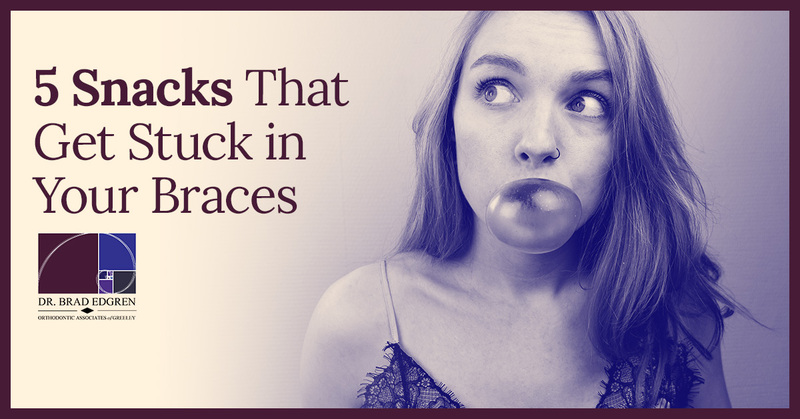 Though you shouldn’t eat some of these snacks with braces, this, by no means, that you can’t eat these foods anymore. All you need to understand is that all of these snacks are difficult to pry from your braces and could potentially cause issues with your wiring. You can still eat these snacks, as long as you know how to properly clean out your braces. Your orthodontist will be able to instruct you on proper care of your braces, whether you have adult, child, or teen braces. If you currently aren’t aware of brace care or are thinking about getting braces, contact Brad Edgren DDS today!